Bilton Ajax JFC Under 9s are grateful to Elliott’s Field, who will be their main sponsor for the next two years. Retail park manager Steve Murray said: “Elliott’s Field shopping park is delighted to sponsor Bilton Ajax Junior Football Club’s under 9s. The club has been established for many years but like Elliott’s Field the under 9s is a young outfit with a bright future and we are proud to be able to support a team at the grass roots level. “It is great to know that funds go directly towards helping the team’s development by providing kit and training equipment ensuring the youngsters enjoy the sport to the full. U12s Red: (sponsored by Richard Sanders): Ajax travelled to Parklands and started well, playing creative football. New signing Arjun Hayer settled in well, battling and winning balls for the team. Harvey Owen was commanding the pitch and his wonder strike from outside the box put Ajax ahead on 10 minutes. Ted McDaid doubled the lead with an intricate dribble round the keeper two minutes later. Both teams created chances but it was Parklands who got the next. Five minutes into the second half a fee-kick from Josh Evans set up Danny Winterlich who calmly rounded the keeper to extend the lead. Ajax pressed for more and Harvey ghosted in to the box to get his second after super work down the wing. Parklands won a penalty in the last minute but Ajax were well deserved winners. Thanks to all the parents who travel to support the team. Man of the match: Harvey Owen. U12s: Long Buckby 4 Bilton Ajax Juniors 4: (sponsored by Bellabambini) Bilton started the stronger and took the lead with Olly breaking through the Long Buckby defence and cleverly looping it over the oncoming keeper. Ajax conceding a very clumsy penalty soon after after a poor challenge. Was neatly finished in bottom corner to make it 1-1 at half time. The second half started poorly, conceding two rapid goals. The boys looked down and demoralised for a little bit but with lots of vocal encouragement from parents they soon responded with an amazing three goals in a very short time. Two neat clinical finishes from Olly and Ethan and the third from a cracking corner by Olly to the back post where Josh finished calmly. With five minutes to go Juniors conceded a tame goal to level the score. U12s: Delapre Dragons Yellow v Bilton Ajax Whites: (Sponsored by PickitPackitSendit) Ajax launched themselves ahead inside three minutes with a shot from Reuben Lee Stringer and an own goal from Timmy Chang’s shot. The Yellows railroaded through the middle of the pitch to score after a hectic first five minutes. Whites were then dominant with neat passing and good use of the wings and Thomas Unett’s neat control created his own finish. Shortly after Timmy Chang, unmarked, claimed a goal with plenty still to do and the half ended from another Lee Stringer finish. In the second half the pace slowed although Ajax continued to create opportunities with an occasional breakaway from the Yellows and Reuben Lee Stringer’s ‘never say die’ attitude was rewarded for his hat-trick and James Patrick’s determination was rewarded dribbling in from the bye line. Thomas Unett’s performance was a notable one, just edged out by Jack Billington as man of the match. U13s: Bilton Ajax 3 Corby Kingswood Black 3 (Corby win on penalties): A hotly contested cup match. 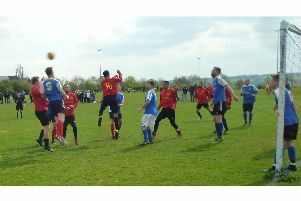 Ajax, wearing their new shirts, kindly sponsored by Cheese on the Green, made their usual dominant start with Wazza scoring within ten minutes then Billy Hancock adding from a close range goalmouth scramble. Corby made it 2-1 at half time. Wazza made it 3-1 but Ajax took their foot off the gas and Corby were 3-2 up. With the boys tiring after putting in a full shift Corby snatched a late equaliser and Wazza’s hat-trick ‘winner’ was flagged offside. Although Ajax lost out on penalties in the most cruelest of ways, well done Sam Coles who did save one and having made numerous saves during the match, earned himself a well deserved man of the match. Well done to all the lads but Ajax must learn to finish teams off from two goals in front, as twice now they have let the opposition back in.